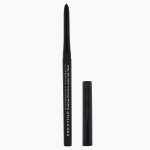 Define your lash lines beautifully with this eyeliner. It comes in a retractable twist tube for hassle-free usage. Imparting a dramatic pigment, it is also waterproof.